Welcome to my first ever VLDC entry. It revolves around fuzzballs, note blocks and plenty of skillfull jumping. Some pure athletic fun! The level progressively builds on the gimmicks further on in the stage, ramping up the difficulty. The focus is more on good, well thought level design, but I have put some effort into making the palettes nice and vibrant. I have now officially SUBMITTED MY LEVEL! I took some of the feedback in the comments into consideration. I will still update the level as necessary. Video is below, as well as a download of the level! This looks neat already! The setups with the fuzzies jumping between the line guides are really cute. 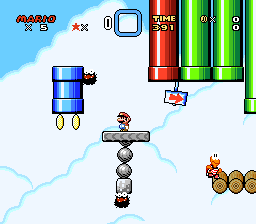 If anything I would work on the section starting at around 0:45, as it seems to suspend the flow of the level for a bit too long for just a powerup. Looking forward to progress on this. I think a couple small sublevels in this could work nicely actually, as long as they don't distract from the meat of the level for too long. Just like how LHB said, the setups with fuzzies jumping are really neat. I like athletic levels and this one didn't disappoint me. The palette setup looks good, however I believe you can make it a lot better by making your own background with a gradient and why not a layer 3 too? 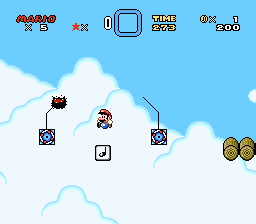 Since it's a sky level, you could make multiple clouds with variety speed on the background or alternatively make some clouds on front and other in behind for extra difficulty. Note on this case you may want to be really carefully to it don't turn into something annoying. 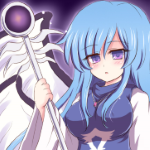 You can use transparency for the layer 3, for instance, if that makes looking better. Together with that, since it's a level full of pipes, you can make a few sublevels with either bonus or hidden dragon coins, so it makes more interesting to play with a few key secrets hidden. You still have lot of time to finish it, so I trust you will make a pretty cool level in the end if you slowly make some gradual changes with my suggestions or LHB's. Thanks for the suggestions you two! I am definitely going to add a few sub-levels to improve the stage a bit (I'm thinking of two with mini-puzzles in them). 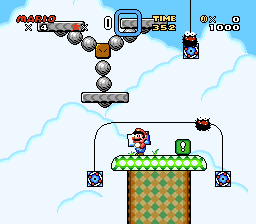 Maybe even reward the player with a cape if they have the green switch activated and complete the more difficult puzzle (paired with a dragon coin so that they still get something if they dont have the switch palace activated). Just a thought. As for the layer 3 recommendation, I will look into it. I've never really known how to do the custom layer 3 stuff, but I think it could add to the stage for sure (transparent in the front would be nice aesthically). The plan is that now that I have the base of the stage done, I can polish the hell out of it for the next two months, adding and revising the stage till I'm truly satisfied! I will say though, not sure I'm going to do any tileset mixing as I feel it won't add anything to the stage and overall I'm pleased with the clean aesthetics. I have updated the level to have 3 different sublevels! Two include dragon coins and the last contains a 3-up moon! As I said before, your level looks pretty much and that's the thing you should be proud of, although it's considerately simple. 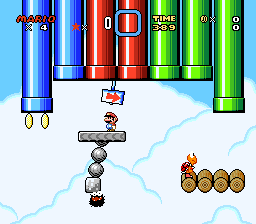 I didn't get some of the sublevels being cave because your level is pretty much in the sky, although they're connected with pipes and these pipes can be long. Although it doesn't mean much, I would make them sky except with lot of clouds above, pretty much simulating walls, ceilings and foreground and a slight different palette so it looks different from the main level. Of course it's up to you. Another thing I'd suggest is adding another enemy to the level, since currently it's pretty much made of fuzzy only. For example, some pokeys or superkoopa. Without them standing out, of course. The fuzzies should still be the main attraction of the level. 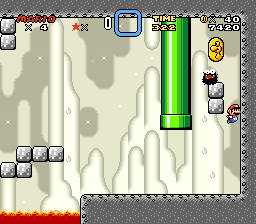 - at 0:58 when you get to cave, you must use the throw blocks to get the vine. 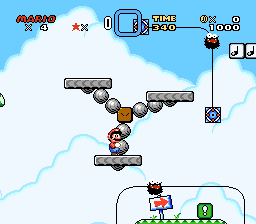 However, you only have two throw blocks available and it isn't that trivial to understand what you do with them and much less to hit the question block containing the vine. I'd place four in there instead, to both give the player enough chances and make it fairly challenging to get the yoshi coin at first try. - the pipe in 2:00 looks a bit too hard to get without dying or getting hit. 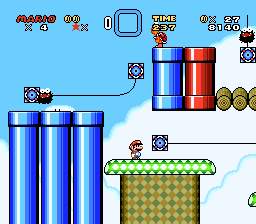 Maybe you should lower it by one more block or exchanging it with one of the red pipes (of course you would move the coin and make the pipe exchanged blue and vice-versa). Oh and, why not adding a custom music to your level? 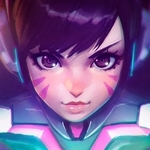 -- it can change your level atmosphere for better. 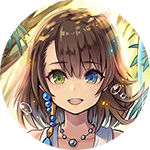 You could insert for example another mario level athletic theme or even some unsampled touhou song, as long it sounds athletic of course (though touhou doesn't have much skyish levels.... eeehh forget touhou i guess haha). Either way, I think it's pretty good so good job! My one suggestion is to extend the platform at 1:40 in the video. Also, there's a few parts where I would move the fuzzies around. Other than that, great level! This is a rare level where difficulty curves are done right, and exploration is just like the original smw in terms of non-linearity while still being straightforward. Thanks guys, I did take some of the suggestions into consideration, mainly improvements to the level design. Not really planning to add any layer 3 or custom music, I like the simplicity and consider this to be a special world -esque stage. Anyways, the level has been updated and submitted! Will continue to update it as needed! the raising and sinking background clouds make me feel dizzy. This level is near perfect in design. My only quibbles are the pipe right after the midpoint, which is too difficult to get into. 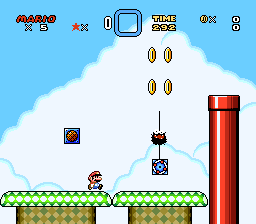 Also, there is a powerup block guarded by a 3-pronged platform and a fuzzy, but the fuzzy is sort of below the screen where the player can't easily see it. Other than that, this was amazing. Thanks for the compliments and the feedback! 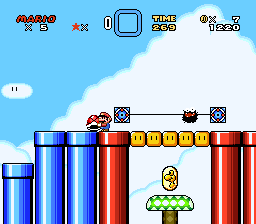 As for the pipe following the midway point, I removed the fuzzy guarding the pipe and added a koopa on the nearby bridge platform. Let me know what you all think of these tweaks. Yeah, seems good. I hope the judges enjoy this. Heh, this level was pretty fun. Feels like something you would see in the original Mario World, yet it has a fresh touch. Good job! Hey everyone, another quick update done to my level, thanks to feedback in this thread as well as a few of the fan judges. 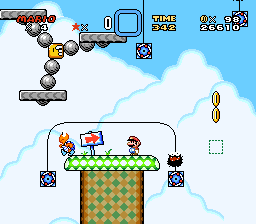 - replaced all fire flower blocks with mushroom blocks. This makes dealing with the chucks slightly more challenging (aside from them, the flower was pretty useless anyways). LOOKING FOR FEEDBACK ON THIS CHANGE ESPECIALLY.